An important theme of Allen Mesch's biography of career army officer (West Point Class of 1825) and respected Union general Charles Ferguson Smith revolved around Smith's influence on budding professional officers (most famously U.S. Grant) during his appointment to the United States Military Academy as Commandant of Cadets from April 1838 to September 1842. 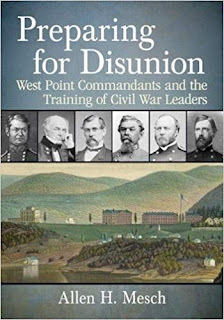 The author's new book Preparing for Disunion: West Point Commandants and the Training of Civil War Leaders expands more broadly upon the topic of officer education between 1817 and 1864, with principal attention paid to the sixteen individuals who assumed the Commandant role during that lengthy period. 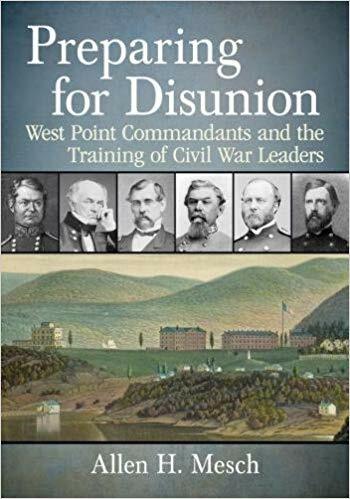 The opening sections of the book offer a general overview of the development of West Point as an institution of military and scientific education, with discussions of the always evolving teaching departments and curriculum. Already familiar to most Civil War students are the contemporary public arguments for and against the Academy, which are duly recounted in the text. Readers are reminded that West Point had many powerful critics who opposed it as an unnecessary public expense that also created an undemocratic, and possibly dangerous, elite class. In their minds, natural "genius" (evidently always assumed to exist enough among the citizenry to meet any national emergency) trumped formal training in the military sciences. Such criticisms waxed and waned over the decades following the founding of the academy, and the book explains how the exceptional performance of West Point trained officers in leadership and support roles during the war with Mexico altered public perception of the value of maintaining a professional officer corps. It's perhaps also worth repeating that the West Point education was not designed to mold generals and army commanders but rather future regimental-level officers (very few of whom could ever hope to advance beyond the rank of captain, even after decades of service) and engineers. According to the book, the 1817-1864 Commandant of Cadets (who served directly under the superintendent) had three primary responsibilities: (1) to oversee cadet training, to include teaching infantry tactics; (2) to enforce army regulations and discipline upon students and staff; and (3) to serve as a bridge between cadets and the superintendent, combining roles of cadet advocate and reporter of disciplinary infractions. Commandants were also expected to be role models of deportment and professionalism. Of the sixteen commandants highlighted in the book, time served varied between mere months and eight years so some officers would have a lasting influence upon the Civil War fighting generation while others would be mostly forgotten. The sixteen officers that held the Commandant of Cadets position between 1817 and 1864 were George W. Gardiner, John Bliss, John R. Bell, William J. Worth, Ethan A. Hitchcock, John Fowle, Charles F. Smith, John A. Thomas, Bradford R. Alden, Robert S. Garnett, William H.T. Walker, William J. Hardee, John F. Reynolds, Christopher C. Augur, Kenner Garrard, and Henry B. Clitz. Discussion of each is presented in seven parts: (1) academy employment and service; (2) the superintendent under whom they served; (3) significant personal contributions; (4) notable cadets overseen, with emphasis being on those who would feature prominently in the Civil War; (5) personal promotion list; (6) comprehensive list of army assignments; and (7) biographical sketch. The sections are date-heavy for ready reference, and many Civil War readers will likely find the contributions and biographical sub-sections of greatest interest (the last particularly for the several lesser-known figures). While the section often deals more with generalities than granular specifics, it's clear that a few commandants had greatly outsized influences on training and officer culture. This biographical register is the chief strength of the book. A very large appendix arranges West Point graduating class data in tabular format, both by year and by aggregate. Another appendix summarizes the Civil War service of the most notable graduates of each class. The notes indicate a heavy reliance upon Cullum's classic biographical register of West Point graduates and officers, but many other sources (mostly published) are also referenced. Overall, Mesch's adoption of a largely non-narrative format of presentation seems most appropriate to the material. However, the volume would have benefited greatly from a more rigorous editorial overhaul. With information and passages repeated at widely spaced intervals, format and organization could have been better streamlined. There are also numerous typos and some careless factual errors (a particularly glaring example of the latter is on page 154, where it is stated that the Union Army of the Tennessee fought at Stones River). Given the solid quality of the author's previous work (i.e. his Smith bio), one suspects that these are more isolated mistakes than worrisome trends. Some of the book's training/tactical discussion is less productive than it could be, as well. For example, the author presents the rifled musket as having profound tactical implications that West Point instruction and graduates mostly failed to appreciate but omits mention of the large and growing critical opposition to the view that rifles had a revolutionary impact on the Civil War battlefield. At least in broad strokes, many publications have discussed how West Point and the war with Mexico influenced the development and prestige of the professional officer corps that later formed the top leadership of both the Union and Confederate armies. Taking a fresh approach that uniquely focuses on the officer training role of the West Point Commandant of Cadets, Preparing for Disunion continues in this tradition. The only book wholly dedicated to the topic, it has useful biographical and general reference value. "very few of whom could ever hope to advance beyond the rank of captain, even after decades of service"
One wonders how the American Civil War might have been different if the antebellum US military had mandatory retirement after 30 years of service as it does now. Wasn't the problem of clearing deadweight in the upper ranks every time a war came around still an issue as late as World War II? Yes. It's my understanding that Marshall and the War Dept. cleaned house during the gear-up to WW2 to make way for the younger generals that we would all come to know. Another interesting variant of that is the officers who left the field artillery for infantry commands so that they could at least be breveted in higher rank. Griffin, Gibbon, and Ricketts are just three examples of guys who may have lingered in the rank of Captain but became Generals. . Reaching those higher ranks in the artillery was a much lower probability. Thanks for the thoughtful and thorough review. I am disappointed that there were any typos especially after the number of reviews. Of course the Union Army at Stones River was the Army of Tennessee not the Army of the Tennessee. I do point out that rifled muskets were slowly introduced into both armies. However, their use and greater range provided a definite advantage to the defense.